…AND I’d like to start things off right by saying thank you for all of your wonderful support in 2018. The Campolo Center for Ministry is founded with a commitment to investing in the training of ministry leaders. Together, we are equipping men and women to effectively share the Good News of Jesus Christ with the people of the world. Our Spring 2019 Campolo Fellows Lecture Series is just around the corner and we’d love to see you at one of these events. Take a moment to read the information below and learn more about the series. Thanks again for your support and I look forward to seeing how God works through our partnership in the year ahead. We’re pleased to announce the Campolo Fellows Lecture Series for Spring 2019, generously underwritten by our friends at the Eula Mae and John Baugh Foundation. Rev. 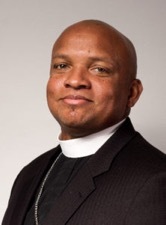 Cean R. James is Founder and Pastor of Grace Christian Fellowship, United Church of Christ (UCC) and Associate Minister of Congregational Development Pennsylvania Southeast Conference, UCC. 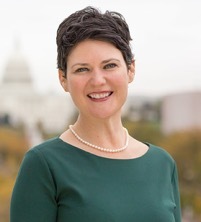 Amanda Tyler, JD, is Executive Director of the Baptist Joint Committee for Religious Liberty. She leads the organization as it upholds the historic Baptist principle of religious liberty, defending the free exercise of religion and protecting against its establishment by government. The Good, the Bad and the Complicated Realities of the First Amendment’s Religion Clauses: The first 16 words of the First Amendment to the U.S. Constitution protect religious liberty in a unique way that has served the country well, guarding against violent inter-religious conflict that has plagued – and continues to plague – many other parts of the globe. Yet both in the past and the present, the United States has failed to live up to the Constitution’s ideals of freedom for all. In this lecture, Tyler will survey the history of how our Constitution protects religious freedom, exploring the contributions of colonial Baptists to its language, and discuss some of its shortcomings as interpreted and applied by the U.S. Supreme Court. She will highlight some of the most complicated and nuanced areas of concern for religious liberty today, including what we even mean we say. Friday, March 22: Presidential Inauguration and Instillation of Dr. Ronald A. Matthews, Eastern University’s 10th President. Rev. 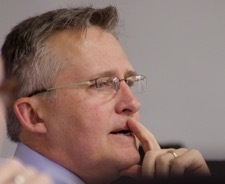 Dr. George Mason is a public theologian, senior pastor of Wilshire Baptist Church, Dallas, TX, and author. His published books include Preparing Pastors We Need: Reclaiming the Congregation’s Role in Training Clergy. One of his passions is encouraging those whom God has called into vocational ministry. Christians without Borders: Toward a Trespassing Church: IN a time when the world lauds groups like Doctors without Borders, which goes everywhere and anywhere to bring lifesaving treatment and bear witness to human atrocities, we hear too many Christians these days defending the borders of nation-states and remaining silent about political cruelty, economic injustice, and religious discrimination. Some Evangelical Christians defend the principles of the modern nation-state, along with hallmarks of it such as nationalism, militarism, and capitalism, as if these carry biblical authority. The consequences in human misery are seen on the southern border of the U.S., the intractable stalemate in the Holy Land, and the sweatshops of Southeast Asia, to name but a few. Naming idolatry is the first step in repentance, but the fruits of repentance will be seen in a renewed commitment to a kind of spiritual transnationalism that at the same time honors diverse cultures and promotes full human dignity and flourishing in the name of Jesus.